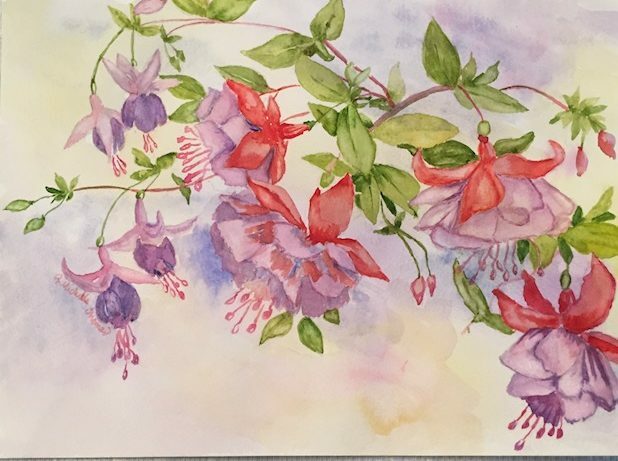 Jean Michelle Thomas has over 25 years of experience as a watercolorist. She finds inspiration in everyday things. The bark of a tree, the sunlight reflecting in the clouds and the smile on a child’s face are her daily reminders of the beauty all around us. Her interest in the arts began as a way to cope with the profound sense of loss following the untimely death of her mother to cancer at a young age. “I learned to appreciate the simplistic beauty in everyday life.” It is this ability to find joy in the things that others take for granted that gives Thomas her artists-eye. Her Bachelor’s degree in Liberal Arts Multiple Subjects and over 20 years of classroom teaching that helps Thomas keep her youthful outlook on life. Thomas feels it is those daily interactions with children and the way they play in a sandbox, or squeal with delight at the touch of a puppy that stands as lessons that life is too short not to appreciate the small things. “Finding a bird’s feather, a colorful stone, or a sun-kissed leaf gives me a child-like excitement.” It is this optimistic passion for simple nature and the human spirit that Thomas hopes to share with others through her art. Thomas is the recipient of several awards from her local art club and has paintings featured in various venues in her hometown. As a lifelong learner Thomas still takes classes in her favorite mediums of watercolor and acrylic paints. Thomas is an avid reader of painting books and watching educational videos of artist’s in action. Thomas can be quoted as saying, “You’re never too old to learn a new skill, or perfect an old one.” Thomas’ hobbies include travelling and photography.